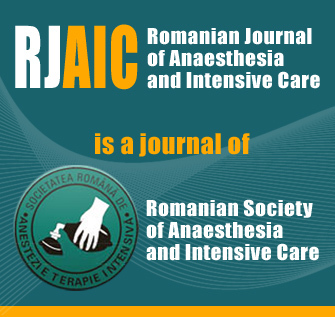 The Romanian Journal of Anaesthesia and Intensive Care is the official journal of the Romanian Society of Anaesthesia and Intensive Care and has been published continuously since 1994. It is intended mainly for anaesthesia and intensive care providers, but it is also aimed at specialists in emergency medical care and in pain research and management. The Journal is indexed in Scopus, Embase, PubMed Central as well as the databases of the Romanian Ministry of Education and Research (CNCSIS) B+ category. editor, book reviews and commentaries. All authors will be asked to sign an assignment form confirming that they have read and approved the paper. Papers are accepted for publication with the understanding that exclusive copyright of the paper is assigned to Rom J Anaesth Intensive Care and “Clusium” Publishing House. The assignment becomes effective when the article has been accepted for publication. Authors should check their manuscript for plagiarism before submitting it. Editors will check every submitted manuscript for plagiarism. At the editors’ or reviewers’ request, the authors should be able to offer the raw data of their study submitted for publication. The manuscript should contain a statement disclosing that any conflict of interest, including financial and other relations, should be declared. If there are no conflict of interest, this should be stated as “nothing to declare”. the Etics Committee and of patient’s consent will result in the rejection of the manuscript. (Animal Research: Reporting In Vivo Experiments) guidelines (http://www.nc3rs.org.uk/downloaddoc.asp? Scientific misconduct includes data fabrication, falsification, plagiarism, redundant publication, ghost authorship or other fraudulent research practices. In order to prevent plagiarism issues, all manuscripts sent to the journal will be screened using the systemantiplagiat. ro soft. In case of the suspicion of scientific misconduct, the Editor will act in confirmity stated in the COPE guidelines and if the fraudulent practice is confirmed the manuscript will be rejected outright. The Editor-in-Chief or one of the Editorial Board members first reviews the manuscripts received, and in about 1-3 weeks decides upon their priority level. international expert. The authors are invited to suggest 2 or 3 reviewers from the respective field of interest. the reviewers and ask them to answer the questions and make the required corrections. Once the revised manuscript is received at the Editorial Office, it is returned to the original reviewers who will make a final recommendation regarding acceptance. During the editorial process the authors and reviewers remain anonymous (“double-blind review process”). Before publication, the British English spellings of the accepted manuscripts will be checked by the Journal’s English Language Editor. Please prepare the manuscript using British English spelling. Accepted manuscripts will be edited for grammar and syntax before printing. The papers should be submitted typed with size 12 Times New Roman font, double spacing. The Abstract in Romanian should use the Romanian diacritical marks. Pages should be numbered consecutively, beginning with the title page. The manuscript should include the following sections, each starting on a separate page: title page, abstract and keywords, text, acknowledgements, references, individual tables and legends for figures/tables. Figures and tables should be numbered consecutively with Arabic numerals in the order they appear in the text. Legends for figures should be typed on a separate page. Each table should have a title. Please add explanatory notes for table/figure/chart abbreviations, for each one, even if these are defined elsewhere in the manuscript. Each image should have an Arabic numeral corresponding to the illustration to which it refers. Please use Système International (SI) units of measurement for all the given results, in the manuscript body and also in tables/figures/charts. Provide tables and charts in an editable format instead of picture/image (.jpg or other) uneditable format. Coloured illustrations will be published only at their best quality. The patient’s face should bear a black strip over the eyes in order to prevent identification. The editors reserve the right to correct errors in style and to shorten the text as deemed necessary. The title page (a separate page) should carry: the full title of the paper and a short title (to be used as “running head”); full name of the authors and their institutional affiliation; department and institution(s) where the study was performed; the name and the address (including email) of the author responsible for correspondence. The abstract (a separate page) should precede the text of the article. For original papers the abstract should be 250 words or less and should be structured as follows: background and aims; methods; results; conclusions. Review articles and case reports will include an unstructured summary of no more than 150 words. For case reports the abstract should include information on the following aspects: reasons of presentation; particularities of the case; the importance of the aspects presented in the field of knowledge about the respective disease. The abstract should be followed by a list of 3-5 keywords or syntagms from the Index Medicus. The footnotes regarding the title should be marked by a * symbol. The footnotes regarding the text of the manuscript should be numbered consecutively in the order in which they first appear in the text. The Introduction should describe the subject of the paper, the present stage of knowledge in the field, the aim and the endpoints of the study. The Methods section should describe the basic study design, the number of studied subjects and how they were selected, the equipment used. The drugs and chemicals used will be identified by their generic name. Every trial should have attached a flow chart (see CONSORT flow diagram at: http://www.consortstatement.org/consort-statement/flow-diagram). Please end the Methods section by describing data structure and also the statistical methods applied to the specific type of data. The Results section should provide the main outcomes of the study, including confidence intervals or P values; table or graphics are preferred. The Discussion section should present the interpretations of the results in the light of relevant literature. The Conclusions of the study should be clearly stated at the end of the manuscript. Acknowledgements should be made only to those who have made a substantial contribution to the study. Disclosure must be clearly stated at the end of the manuscript. which should contained inside brackets. Journals’ names should be abbreviated as in Index Medicus. References must be verified by the author(s) against the original documents. Rom J Anaesth Intensive Care also checks the accuracy of the references. The Journal accepts electronic submissions of manuscripts in Microsoft Office Word format , whether on CD by mail or as attachment to e-mail (manuscript, figures and tables). The word count for the text is up to 4000 words for original articles, 2000 words for case reports and 5000 words for review articles. The illustrations can also be submitted electronically. • if text and images are submitted simultaneously, the images should be submitted as separate files (please do not embed jpeg images in Word documents!). software, including their version number.